You can adjust certain features in the app by going to the “Settings”. Tap the back button until it says “Home”. This will open the main menu. Choose “Settings” and you will see the page below. Dark – This will change the entire app to have a dark backdrop. This is useful in low light situations. When you change this setting the “Settings” page will not be dark until you leave and come back. The rest of the views will be loaded with the correct setting. 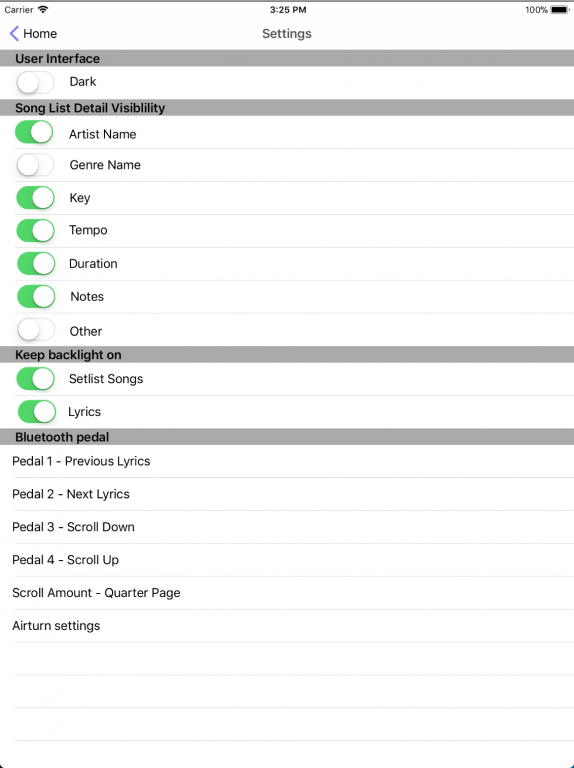 This section of the settings allows you to show or hide the song attributes on the song list. This will affect the song list and the setlist song list. This setting makes the app keep the screen on when you are looking at one of the views below. Typically your device will turn off the screen when it is inactive for a certain time. Setlist Songs – This setting will keep the screen on when you are on the Setlist Songs page. Lyrics – This setting will keep the screen on when you are on the Lyrics page. This section will allow you to adjust the settings for a Bluetooth pedal. The development of the app focused on the Airturn brand of pedals. To use the Airturn pedal you need to turn on Airturn support by tapping the “Airturn Settings”. There is more information about “Airturn Settings” below. The image below shows the different actions that can be performed with a Bluetooth pedal. All of the options below are used on the Lyrics page. 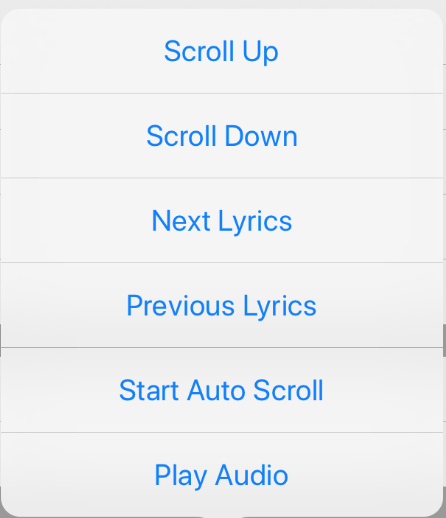 The “Next Lyrics” and “Previous Lyrics” option will only work when you viewing lyrics in a Setlist. Pedal 1 – This is the left pedal of the Bluetooth pedal. Pedal 3 – This is the second pedal for any “Two Pedal” Bluetooth pedal. Scroll Amount – You can adjust the amount the page will scroll when you use the “Scroll Down” or “Scroll Up” options. 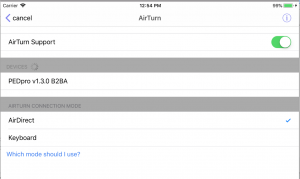 Airturn Settings – This will allow you to pair the Airturn pedal with the app. You will see the screen below when you tap “Airturn Settings”. To get the Airturn pedal work with the app you must turn on the Airturn Support and connect your pedal. When the pedal is connected tap the “Which mode should I use?” link to help you choose the right mode. For more information on the Airturn pedal visit http://www.airturn.com. If you are interested in purchasing any products from Airturn Please support Setlist Helper by clicking any of the Airturn links on this site. Setlist Helper will get credit for your purchase.